There is no shortage of good, even great Kullervos in the present catalogue. Indeed, the work seems to have had a major renaissance in recent years, at least compared to my teens when the only version available seemed to be the now much revered Paavo Berglund/Bournemouth Symphony version on EMI. How well I remember the 2 LP box and the blazingly intense performance it contained. I hate to harp on about formative listening experiences, but they do shape your view of a piece for years to come. It seemed an age before we got anything as good, but like a London bus, they all come at once and Robert Spano’s beautifully played and recorded performance is the latest in a line of distinguished new recordings of this marvellous work. We all know it is early Sibelius and yes, there are weak moments and odd longeurs in this sprawling, epic score. There is a debt to Bruckner and Wagner in certain passages, as well as the odd hint that he knew his Russian masters. It has to be fortunate for us that he had to sell the score rather than suppress it, as he most likely would have done, particularly as it seems to be light years away from the sparse, concentrated form of his later works. If viewed as a symphonic cantata, there are also some glorious moments that point us directly towards the mature Sibelius, such as the long pedal point build-ups, the rhythmic ostinatos and the woodwind writing, especially the passages where they play in thirds. Robert Spano clearly believes in the score and he has drilled his forces well. He conducts a relatively leisurely reading, one with bags of mood and atmosphere that compares well with, say, Jukka Pekka Saraste’s searing - and underrated - account on budget Ultima or Colin Davis’s spacious but magnetic reading on LSO Live, to say nothing of the Berglund, now part of a big – but cheap - box. The disc starts impressively with the Brucknerian urthema rising out of a Finnish mist. Davis’s live reading possibly digs even deeper, but the Atlanta orchestra plays beautifully in all departments and there is a real magnetic sweep to this music-making. 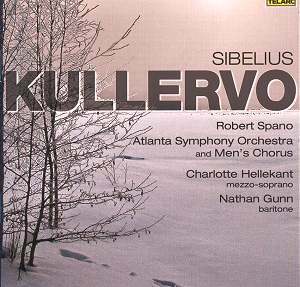 The second movement, ‘Kullervo’s Youth’ is beautifully shaped, tender and moving and with memorable colour and unanimity from the woodwind right from the start. The heart of the symphony is the long central movement ‘Kullervo and his Sister’, Sibelius’s first setting of the Kalevala and a veritable operatic scena involving the two soloists and chorus. I must say that the large male choir continue the venerable tradition of past Atlanta choruses; their diction is simply superb and the tonal impact thrilling. Of the two soloists, I prefer Nathan Gunn, strong, full-voiced and more youthfully virile than the ubiquitous Jorma Hynninen. Mezzo Charlotte Hellekant shapes the words well but doesn’t produce as memorable a tone as Monica Groop for Davis and Saraste. Spano whips up a real urgency in what is the symphony’s scherzo, ‘Kullervo goes to War’, a difficult movement to bring off, and here the superb Telarc recording comes into its own, with glorious clarity, range and presence. The finale is genuinely moving, preferable here to Davis, whose grunts and groans are audible and whose recording is drier and less well balanced. Of course Davis is cheaper than Spano, as are quite a few others, so the buyer is in an enviable position. There are, quite simply, lots of impressive Kullervos now on the market – to the above you can add Vänskä and Järvi - but this brilliantly engineered Telarc disc has a cumulative impact that is truly impressive, so an impulse purchase will most definitely not disappoint.